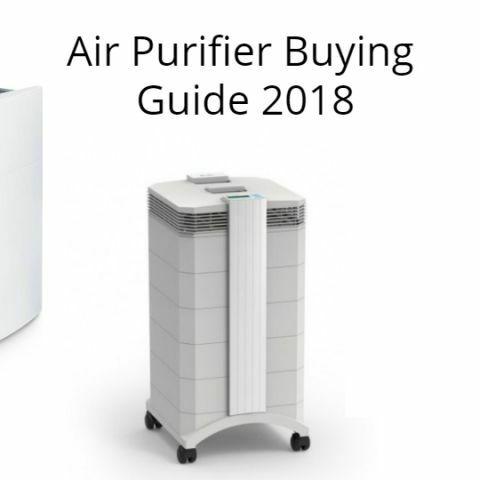 There’s a lot to consider when purchasing an air purifier and our buying guide is here to help you decide what to be mindful of when getting one for your home. This winter season, you might not be able to do much about the worsening air quality outdoors but you can control the quality of air inside your house using an air purifier. It’s high time to pick one up if you live in a metro, Tier-I or a Tier-II city. We understand that it can be difficult to select an air purifier from the numerous options available in the market. There are many factors to consider like a device’s performance, cost of maintenance, types and grade of filters, and more. Fret not as Digit is here to help guide you through the process. Our air purifier buying guide will break down the process of buying an air purifier in simple steps so that by the end of this guide, you will have a fair idea of what kind of air purifier you need. Without getting too much into details, one needs to remember that the air quality is decided by the amount of particulate matter per cubic meters of air. Most prominent pollutants are PM10, PM2.5, PM1.0 and particles all the way down to the ultrafine particles measuring 0.3 microns and below. There are also gases and other volatile compounds that need to be taken into account like NO2, SO2, NH3, CO, and lastly O3 or Ozone. These gases can act as irritants and even be downright hazardous. Air Quality Index (AQI) is a much simpler way of representing the overall air quality. AQI is divided into six categories, namely Good, Satisfactory, Moderately Polluted, Poor, Very Poor, and Severe. One can simply take a look at the AQI to understand what is the current air quality level. In India, the AQI is calculated using a complex formula and the worst sub-index from eight pollutants like PM10, PM2.5, NO2, SO2, CO, O3, NH3, and Pb. Air purifier shootout: Which one should you buy? PM10 is the largest particle, which is generally visible to the naked eye in large concentrations. Smog, smoke and dust in the air are comprised of PM10 particles that are 10 micrometres or smaller in diameter. Similarly, PM2.5 is a particulate matter of 2.5 micrometres or less in diameter. To provide perspective, a single human hair is around 100 micrometres. So, why does this all matter? Good question. You should know that the permissible limits of PM2.5 and PM10 particles over 24 hours is 40µg/m3 and 60µg/m3 respectively. If these levels are exceeded, then there is a potential risk of a perfectly healthy person developing breathing disorders when exposed to them over a prolonged period of time. We can understand this easily with the AQI and the associated health impacts below. Now that we have some basic understanding of how air quality is assessed, it doesn’t come as a surprise that the air quality inside your house is directly affected by how good or bad air is outdoors. In case you live in an area where the AQI outside ranges from Good to Moderate (AQI 0-200), you probably don’t need an industrial grade air purifier like the IQAir Healthpro 250. However, if the average AQI in your region ranges from Poor to Severe (between 200-500), then one needs to take appropriate measures to minimise the health risks that come with degraded air quality. One can head over to https://app.cpcbccr.com/AQI_India/ or http://aqicn.org to check what is the overall AQI in their city or area. If you are lucky enough to be living in a city where the AQI is good or satisfactory, then you might be able to get by without actually investing in an air purifier, unless you suffer from respiratory issues. In case you are situated in an area where air quality outdoors is bad and the AQI is ranging from Poor to Severe, then buying an air purifier makes absolute sense and is highly recommended. Air purifiers come in all shapes and sizes and range from being portable to being installed in place via ducting and other methods. Almost all air purifier manufacturers advertise a metric called Clean Air Delivery Rate or CADR and you need to keep an eye out for this as the higher this value is, the more amount of cleaner air a purifier is able to throw out. However, there are some companies like Dyson that make air purifiers but don’t undergo the CADR test, like the company's Pure Cool air purifier. Dyson employs its own Polar test for demonstrating the air purification capabilities of its devices. You should also inquire about the coverage area of an air purifier and compare that with the room size where it is to be placed. Do note that many manufacturers simply state that their device is effective for rooms ”up to X sq. ft.” but that's just a marketing gimmick, which is equivalent to stating that an air purifier can work in a large closed auditorium, given that it's left running overnight. You should instead ask for the device's effective coverage area as it gives a more accurate estimate of what it's air purifying capacity is. Both, CADR and effective coverage area values are important factors to know before buying an air purifier. The higher these metrics are, the better an air purifier can be expected to perform. Keep in mind that the air delivery and filtration efficiency determine the overall effectiveness of an air purifier. Air purifier manufacturers can use different types of technologies in their device that determine the filtration efficiency. Most air purifiers found in the Indian market are of the mechanical type, which means that they employ a filter for air purification. They can also be paired with other types of filtration techniques like electrostatic precipitator, UV technology, Ionizer (anion generator) and Ozone generation. Ozone is a harmful gas that can cause lung damage on the surface level and you should avoid any air purifier that produces it. Some air purifiers that employ an ionizer (sometimes called an anion generator) or electrostatic plates, could also generate ozone in small quantities. However, many air manufacturers claim that they have circumvented the problem of ozone production and their devices are completely ozone free. Electrostatic precipitators use two electrostatically charged plates to attract charged particulates in the air. However, one will need to clean these plates almost twice every week to maintain a higher level of efficiency. UV rays can be used in some air purifiers to kill bacteria and viruses in the air but this process is also prone to generating Ozone unless there’s some other method used to remove the gas. Buying a simple mechanical air purifier is recommended and in case you go for a device that uses any other means of air purification, ensure that there’s no ozone produced in the process. Higher CADR and effective coverage area means that an air purifier will be able to supply cleaner air at a higher rate. It will also not give up when you move it from a smaller room to a slightly larger room, however, the grade of a filter used on the device is as important as the aforementioned factors. An air purifier can come fitted with one, two, three or even more filters and is only as good as the quality of these filters. Most air purifiers use a High-Efficiency Particulate Air/Arresting/Adsorbing (HEPA) filter and you should pick an air purifier that has one. To be classified as a HEPA filter, a filter needs to trap 99.97 percent of particles, down to the size of 0.3µm present in the air passing through it. HEPA filters are classified on the level of their performance and start at grade E10, E11 and E12, that have a total particle retention of 99.5 percent. Then there are H13 and H14 grade HEPA filters that are most commonly used on home air purifiers and they go all the way up to grade U15, U16 and U17, which are used for commercial and industrial purposes. Remember that the better the filter grade level, the better an air purifier will perform, at a premium incurred by the buyer. Most air purifiers makers use the H-13 grade HEPA filter because it strikes the best balance between cleaning efficiency and price. However, the size of a HEPA filter is also another crucial factor. Larger the filter surface area, more air will pass through it and ultimately, will result in a better CADR. This is why you would notice that many air purifiers come with a cylindrical design, and a circular HEPA filter, which is aimed at reducing the space taken up by an air purifier while trying to maximise the filter's area as much as possible. Now that you know about the size and types of filters, we come to the number of filters used on an air purifier. As mentioned before, air purifiers can use one, two or even more filters. 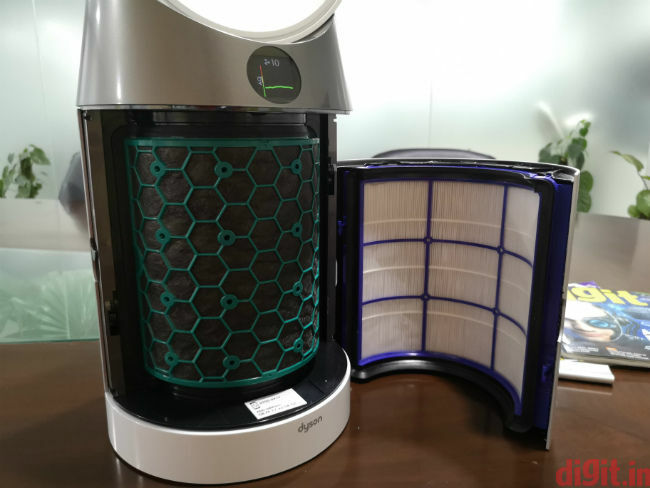 Majority of air purifiers available for homes in India use a HEPA filter and interestingly, you will find more number of filters on the low and high end of the spectrum with purifiers like Kent Alps (review) and the IQAir HealthPro 250 (review) respectively. Mid-range air purifiers like the Blueair Classic 280i (review) use a single filter and also come with filters that are a combination of HEPA and carbon filter. Air purifiers that use multiple filters usually have a pre-filter installed, which is the first line of defence against harmful pollutants. It traps PM10 and larger particles like dust, hair, pet dander, and other pollutants. Most pre-filters are washable and are introduced to prolong the life of subsequent filter(s) that handle finer air filtration. You will find that in most air purifiers, either HEPA or an activated Carbon filter will be placed immediately after the pre-filter. Using activated/impregnated Carbon helps in removing harmful gases and odour from the air as carbon has a high surface area and chemical bonds that adsorbs harmful gases. The general rule of thumb is that the more Carbon content in a filter, the more effective it is in cleaning the air. If the air purifier you're looking at has an activated carbon filter along with a HEPA filter, it's definitely a plus point. However, you should ask for how much carbon content is used in the filter, which is usually in grams or kgs depending upon the price of the air purifier. 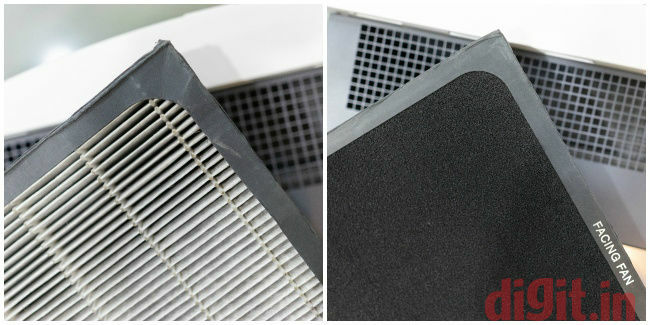 Filters used on an air purifier are exhaustible and need to be replaced after being used for a certain amount of time. Pre-filters generally need to be washed once every couple of weeks, and a good carbon filter lasts for a longer duration of time as compared to a HEPA filter. While air purifier manufacturers might say that their filters need to be replaced every six months or once a year, you should ask for the total filter life in hours and then consider how many hours you will run the air purifier. The filter’s life will then depend upon its quality, the pollution in your area and of course, the total number of hours an air purifier runs in a day. 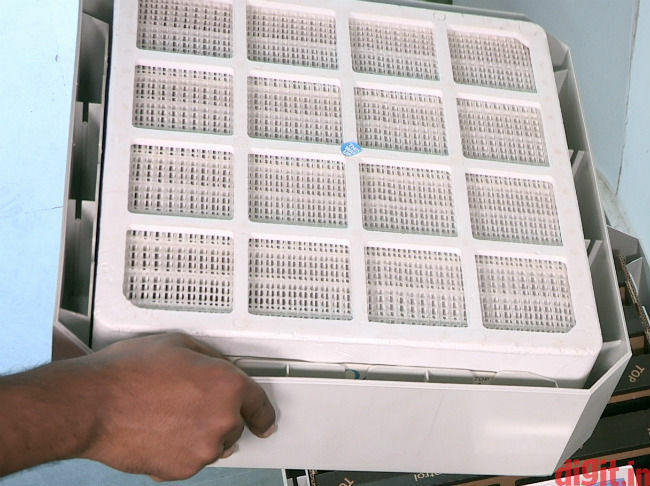 One should also check how easy it is to replace the filters on an air purifier. Whether the filter assembly is too complicated and if one can replace the filters themselves or need to call the company for getting the filters replaced. For example, we noticed that it’s easy to replace the filters on the Blueair Classic 280i as it has only one filter and not a difficult assembly. In contrast, air purifiers like the IQAir HealthPro 250 air purifier houses three filters and it can be confusing to properly arrange and set them up. Most modern air purifiers come with new features that make them more convenient and easier to operate. With IoT connectivity and app support, they can be remotely controlled and can also display real-time particulate levels in the air inside the room where they are placed. Look for an air purifier that comes with integrated sensors and shows air quality metrics either with an onboard display or at least via its app. While one can’t expect the onboard sensors to be extremely accurate but they should be in line with what the outdoor air quality metrics are and it should either display the PM2.5 levels or the overall AQI. If it also shows PM10 particles and the Volatile Compound level (VOC) in the air, even better. Buying an air purifier need not be a daunting task if you keep some things like the filter grade, air purifier types and some other things in mind. Knowing where you will be using the air purifier is a crucial aspect as the outside air directly influences the indoor air quality and one should accordingly pick an air purifier. As the level of toxic gases has also increased exponentially after Diwali, we suggest that you buy an air purifier with a carbon filter and good CADR. Additionally, a display or any type of indicator that will give an idea of the current IAQ should also be preferred.